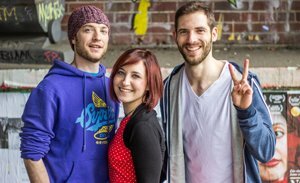 There are a couple of things I’ve learnt since being involved in the food industry. If you want a good curry, speak to an Indian cook. If you want good potatoes, speak to an Irish cook. 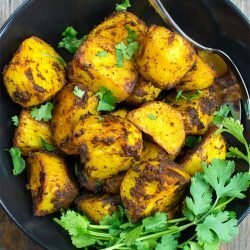 If you want the best curried potatoes in the world (sometimes known as Bombay potatoes or spiced potatoes), then combine them. I know I just made a big claim, and I’ll stand by it. 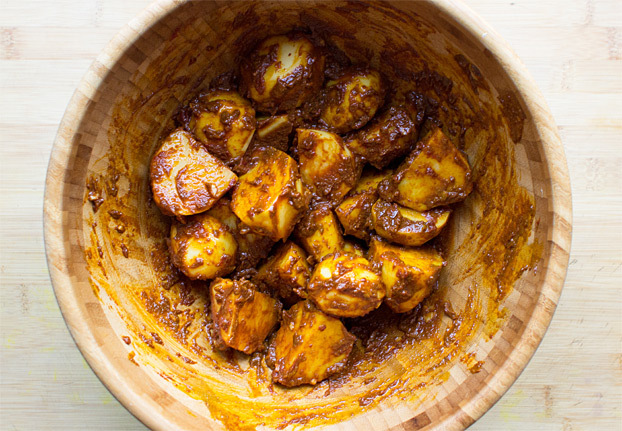 I have never eaten better curried potatoes than these Irish Bombay potatoes, and I’ve eaten more than my fair share. 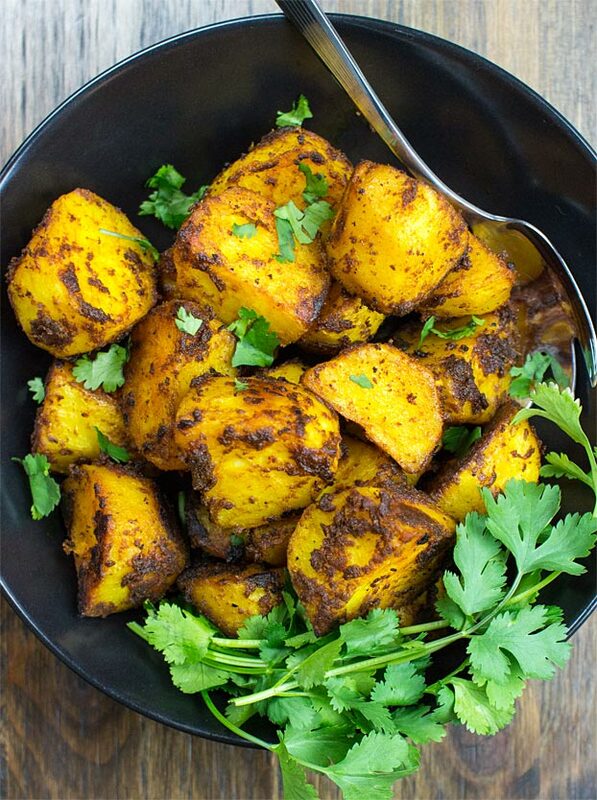 Curried potatoes can be made in a variety of different ways, from parboiling to frying, with a thousand herb and spice combinations. Let’s keep things simple. We’re only going to roast these potatoes, we’re not going to faff around with ten different methods. I will, however, show you a roasting technique at the end to set your curry-world on fire (well not literally, I hope). We’re also going to use a curry paste. 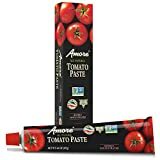 A self-contained curry paste includes a load of spices already mixed together to great taste – there’s no need for trial and error and buying a load of different spices you’ll rarely use – this will guarantee perfect results, every time. 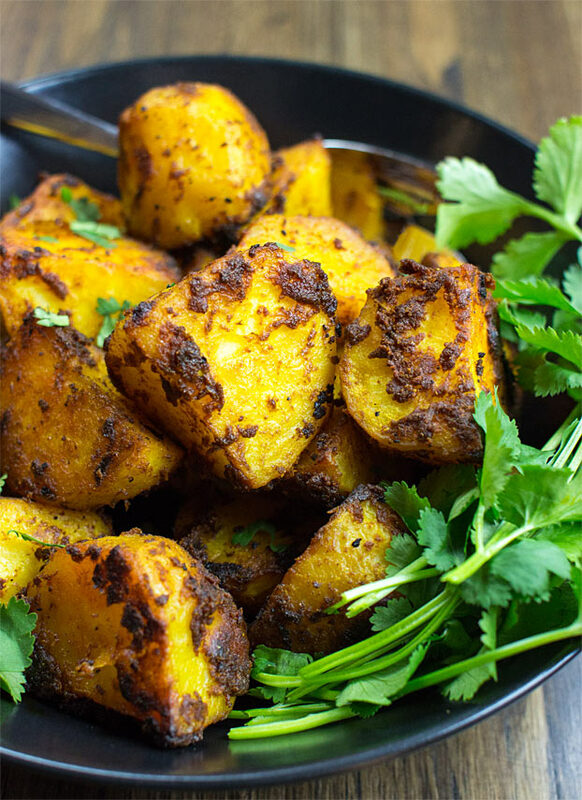 I highly recommend tikka paste or korma paste for curried potatoes – although I generally love my curries spicier than that, I feel these two pastes work best for Bombay potatoes. And I’ve tried a lot, believe me. You can choose can from whichever herbs you have to hand – basil, parsley and rosemary all go very well. If you don’t have fresh herbs, dried are also fine – just add them a little earlier in the cooking stage – about halfway through. Fresh herbs can go in just a few minutes before the end – we don’t want them to crisp up. 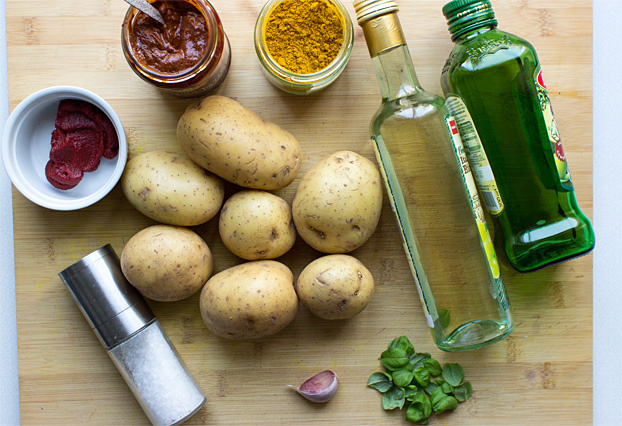 What’s the real secret to curried potatoes? Do tell! Alright, I will. 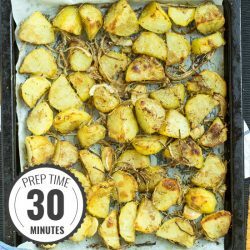 If you’re short on time, just mix the potatoes with the ingredients in the recipe below, throw in the oven, and leave for 30 – 40 mins (depending on potato size), giving them a mix after 20 minutes or so. But if you have a few minutes to spare, then try this out. After half an hour of cooking, remove the potatoes from the oven for five minutes, and let them start to cool. Leave the oven on. After five minutes is up, put them back in at the same heat. Cook for another five minutes, then remove again. 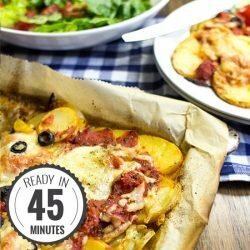 After five, back into the oven and…cook for five! Repeat twice more. This method crisps up the outside of the potato something beautiful, while leaving the inside soft and fluffy. The curry flavours really sink into the potato too, and you’re left with absolutely wonderful Bombay potatoes. I guarantee you have never eaten curried potatoes this good before. This recipe goes out with great gratitude to our friend Ciaran, an Irishman living in Hamburg. He makes music as well as Bombay potatoes, so if you’d like to check out his tunes you can do so here. 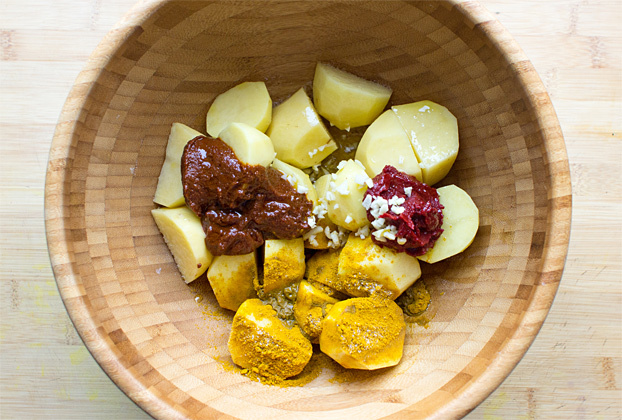 We guarantee you’ve never eaten curried potatoes this good - they’re the perfect fusion of Indian curry and Irish ingenuity. They will not be beaten. Heat up oven to 200°C/390°F. Up to you if you peel the potatoes. Quarter the potatoes and place in large bowl. Add the salt, tomato paste, curry paste, curry powder, and oil. Give it all a good mix and make sure each potato is well covered. Layer the potatoes over a large oven tray and place in oven. After 15 minutes, remove from oven and (if using) add the dried basil and garlic. Roughly flip the potatoes and ensure the basil is mixed in. Cook for another 10-15 minutes - the potatoes should be easy to pierce with a fork. If using fresh basil and garlic, add about five minutes before the end of cooking, once again making sure it is all mixed in. 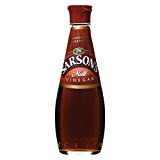 Serve (with malt vinegar if desired) as a side dish or with dips like yoghurt, hummus or creme fraiche. To get an even crispier yet still fluffy texture to the potatoes, follow the first steps of preparation as above. 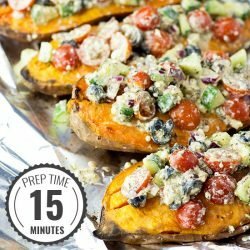 After cooking for 15 minutes, remove the potatoes from the oven. Add the dried basil and garlic (if using) Let cool for five minutes, then put them back in the oven for a further five minutes. Remove them again and let cool, followed by another five minutes of cooking. Repeat twice more, adding the fresh basil and garlic (if using) before the final five minutes. 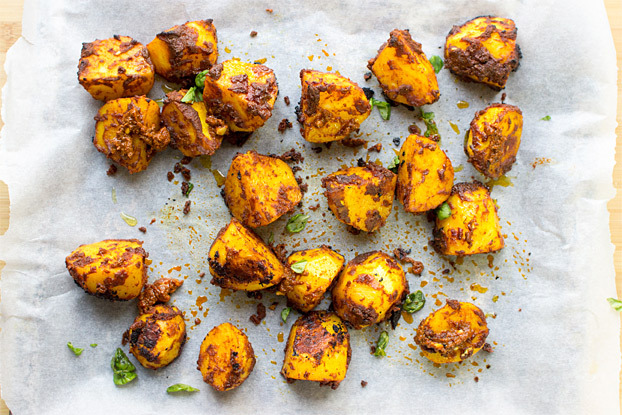 These Bombay potatoes are unbeatable. If you think the potatoes need it, add more oil while cooking. Don’t let them get toooo crispy (or black). If the spices/paste/herbs do start to burn on the baking tray, move the potatoes individually across to a new tray/new baking paper and continue cooking. It won’t take long and the outcome is more than worth the effort. If you liked this recipe: then there's a very good chance you'll love this chickpea curry. It rocks! As does this awesome side dish, cucumber raita! I have made these twice last weekend, had leftover for breakfast. Making them again tonight. I only used half the oil and was perfect. Very nice. All the options for the herbs are much appreciated, meant I could use up some rosemary I wouldn’t have known what to do with otherwise. Will make again!